I may have just committed the biggest food sin of all time. I made a salad out of watermelon. 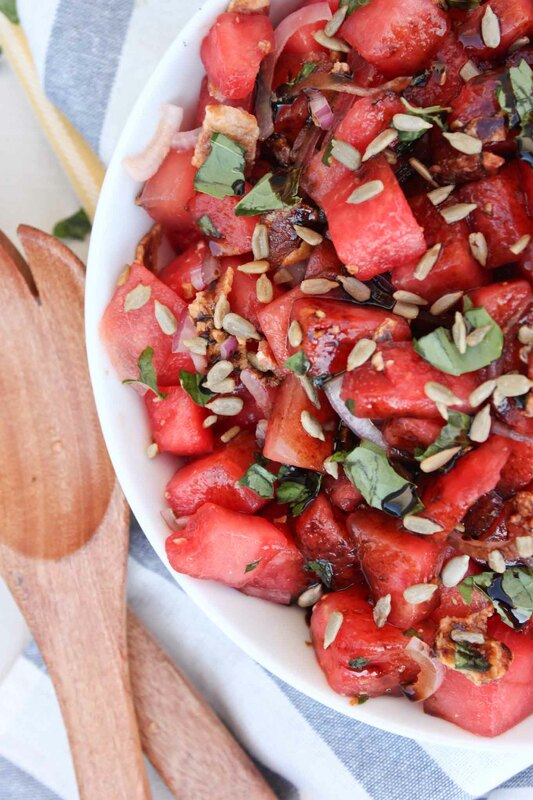 Juicy, sweet, plain, delicious watermelon turned into a savory, basil, bacon, and red onion watermelon salad with a sweet and tangy balsamic drizzle. It may be okay though. I mean I’m still adjusting to this new way of life. You see watermelon is my source of life in the summer. I am ashamed to tell you how many watermelons I could consume in a summer month, but it is a lot. Probably more than a person should. But how can you deny the most scrumptious fruit of all? Lightly salted, with a juicy sweet twist. Nothing better and I say it really is nature’s true candy. So taking that piece of natural perfection and turning it into a savory salad was hard. Like really, really hard for a weird and slightly nerdy foodie like myself. Some things you just never touch and I have to say this once was watermelon for me. Why change something so divine? Surprisingly, it wasn’t too bad. 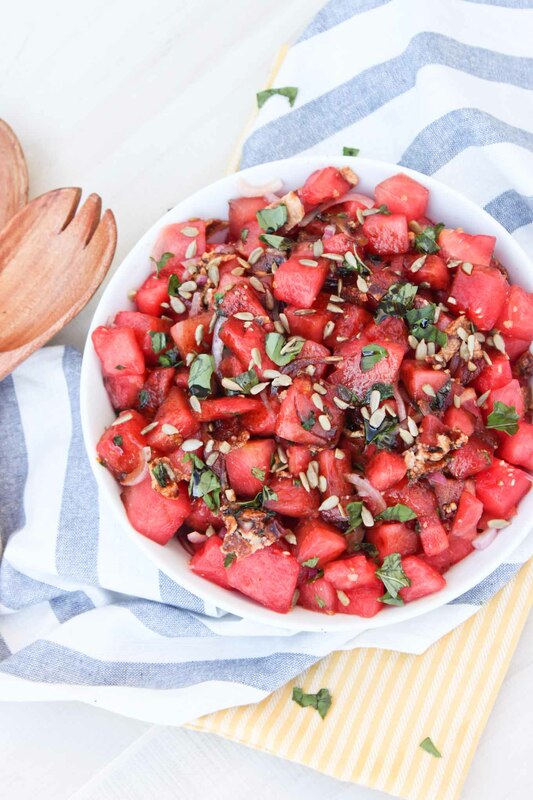 I mean don’t get me wrong, there will always be a place for plain, sweet watermelon straight from the rind but this, this is something to wow your guests and put a new spin on a summer salad. Between the bacon and the sweet and sticky balsamic glaze with the hint of mint and fresh basil and you have yourself the start of something real. It is all about layering when it comes to a salad. I always start with the end goal in mind. 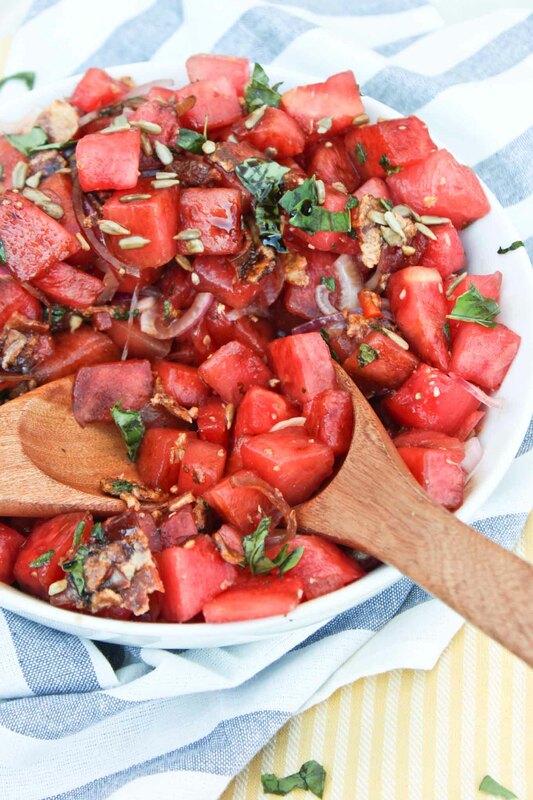 In this case a savory watermelon salad with red onions and bacon. 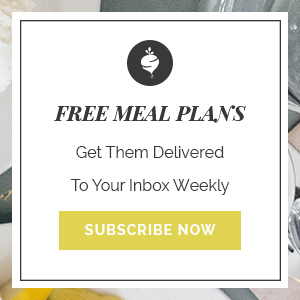 From the basics or the foundation you just begin adding, sampling and adding some more until it is the perfect combination of flavors that ignite every taste bud inside your mouth. From watermelon, bacon and red onion I added chopped fresh basil and a bit of chopped mint to pull together into an unexplainable freshness. But it was missing something. Maybe a crunch and any nut or seed will do from sliced almonds to sesame seeds and even pumpkin seeds. The options are endless and paired with the sweet balsamic drizzle pulling it all together, you’ve just created a unique, interesting and delicious rendition of a summer salad. Perfect for a hot, a blazing hot summer day. 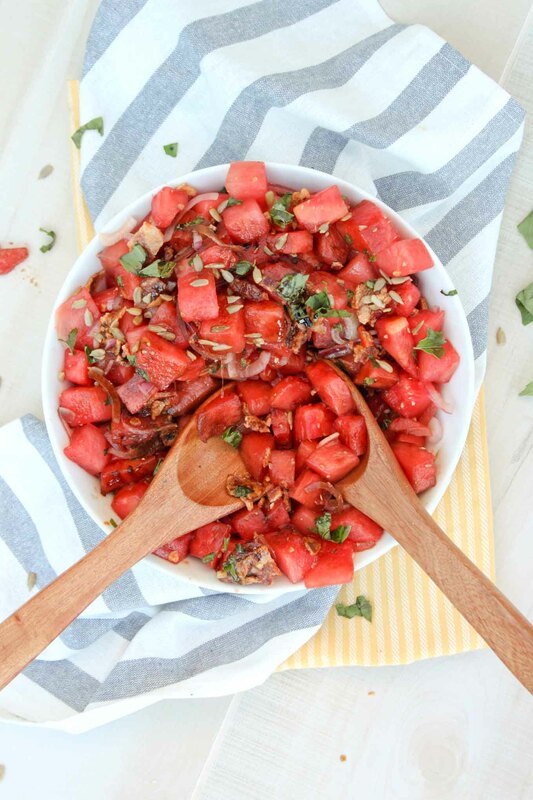 Now go get your watermelon on and leave a comment below if you prefer watermelon be left alone or in a savory dish such as this. To make glaze, add balsamic vinegar to a small saucepan and sweetener (if using) bring to a simmer and let simmer until reduced in half. Cube watermelon, slice onion, and chop fresh basil and mint. Add watermelon, onion, basil, mint to a large bowl. Toss with olive oil and salt. Once bacon is done and slightly cooled. Chop and toss in salad along with feta if using. Drizzle salad with balsamic glaze and enjoy. 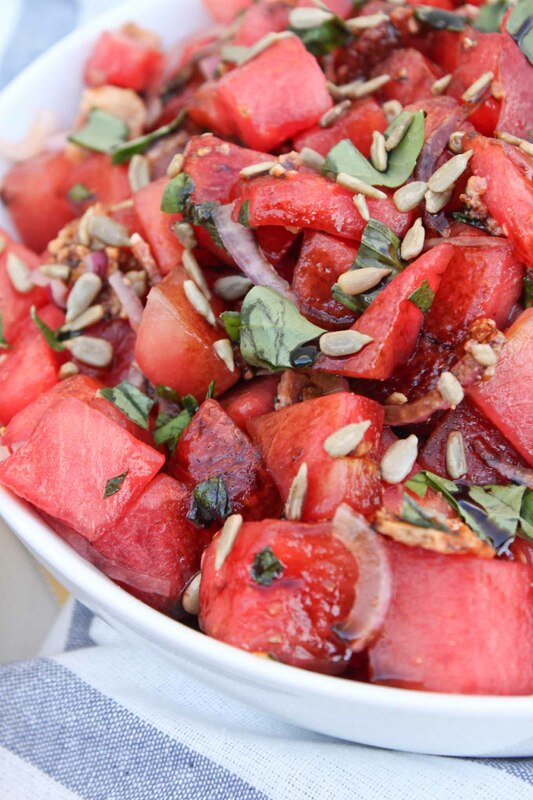 **Because the watermelon releases water as it sits, this salad does not store well.